Historically, the remanufacturing process was rather simple. For example, pre-owned automobiles were traded in at dealerships, fixed, cleaned and then put it on the lot for sale. Product reclamation was easy—the customer brought the old unit right to the dealership. The market value of any commodity is variable. One key to removing expense from locating returnable items is figuring out where the items are, how long they have been in service and when their replacement might be imminent. When parts are recycled into the production supply, CPQ can identify which parts are new and which are recycled. Pricing variability is reflected in the roll-up price calculated by CPQ. Indeed, the option between new and recycled can be deliberately built into the selection process. 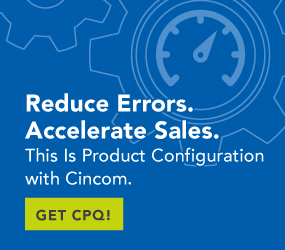 CPQ maintains multiple pricelists for finished goods as well as for individual components, so maintaining a remanufactured product price list is easily accomplished with CPQ. The practice of distributing remanufactured products does need to take into account any legal prohibitions that might prevent the use of reclaimed parts or materials. While these barriers will likely decrease over time as more and more companies remarket products as an option or as a standard process, there will always be some limits or applications requiring original equipment. Certain reclaimed products may be more difficult to extract from the whole product as it is recycled. The final quality evaluation for these products may involve some variable level of suitability for re-use. CPQ can identify multiple quality levels and restrict the use of products within a given level to specific limitations. Most of us want new products. This is especially true of higher-priced, sophisticated or complex products. There is security in the knowledge that what we are buying has not been worn or previously used in a way that will diminish the lifespan of the product we are acquiring. CPQ can clearly identify the specific content in a whole product that is remanufactured. When presented to the customer with applicable comparative cost savings realised, the customer can make an informed decision about selecting new or remanufactured. This is a very real issue especially at the far end of the reverse logistical supply chain. The process of evaluating candidate parts replacement and overhauling/reconditioning of those parts may require specialised knowledge. CPQ can help with this once the recycled part is in-house by guiding the classification process using the same interactive interviewing process used to configure a product. Condition, age, quantity and other variables can be documented and prompt the ultimate classification of the products on a consistent basis. This is a very difficult issue for builders of proprietary technology utilising processes, skills and materials that may be classified as trade secrets. In many cases, these concerns diminish over time as the competitive advantage of the proprietary aspects of the product diminish. Remanufacturing is no longer a green sideshow to help companies build an image of ecological responsibility. It has become a mainstream feature of the whole manufacturing process. Utilisation of remanufacturing techniques and processes will continue to grow and become more commonplace across more industries.